So, here's the thing: I will read anything Taylor Jenkins Reid writes. I knew I'd discovered a favorite author the moment I finishing reading her very first book, Forever, Interrupted. But it was After I Do that turned me into a complete fangirl. Taylor consistently creates characters that feel realistic and relatable and then places them in highly emotional situations. In different ways, each of her books focus on the same themes: love and heartbreak. But despite the similarities between them, each book stands on its own. 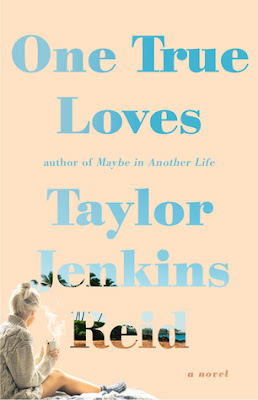 One True Loves was one of my most-anticipated books of 2016. And I'm truly embarrassed to say that I read it back in MARCH but am only just now reviewing it. Total fail, y'all. But don't let my procrastination fool you - it's not an indication of how I felt about the book! As I expected, One True Loves is one of my favorite reads of the year. It's been months since I finished it, and almost nothing that I've read after has even compared! Reading a Taylor Jenkins Reid novel means falling head over heels for each character -- and it also means thinking about your own love stories in a new and compelling light. That's it exactly. I love Taylor's writing, characters and stories for a variety of reasons, but one of the biggest is the way they make me think about my own life. Finishing one of her books always leaves me in a reflective mood, and her latest is no different. Maybe in Another Life explored the idea of fate versus chance by taking a tiny decision and spinning it off into two separate paths. Is the heroine destined to be with a certain person? What role does choice play in the matter? In many ways, One True Loves felt like an extension of that theme. Emma Blair marries her high school sweetheart, Jesse, and has an incredible life with him. They move away from home and travel the world together out of their shared desire for adventure. But on their first wedding anniversary, Jesse goes missing in a helicopter accident over the Pacific. It's a tragic end to their love story. Lost and grieving, Emma moves back home and a creates a new life for herself. Years later, she finds herself falling in love and finding happiness with her old friend Sam. Then, Jesse is found alive. Emma now has to figure out who and what she wants. Who is The One for her? Although it goes against what's often depicted in popular culture, I don't believe in the idea of The One. That may sound unromantic, but hear me out. I think there is more than one person out there that we could marry and spend a life with - and that what makes love meaningful is the act of choosing and committing to one person. So, the concept of One True Loves was right up my alley. It's already a question I've pondered on my own, and I couldn't wait to see how Taylor would explore it in this book. I don't wait to spoil anything, so I won't say much more about the plot. But I will add that I was emotionally invested from the very first chapter, despite the somewhat improbable circumstances, and that there's no one I'd rather see write this story. These relationships feel so authentic - the love stories are complicated, honest and engaging. I appreciated the unique structure of the book, which is something I've come to expect from Taylor. I was thankful that family was important to Emma, and I loved seeing her interact with her parents and sister. I mentioned earlier that I felt like this was an extension of the concept explored in Maybe in Another Life, and that's mainly because they explore a very similar question. But where the other book focused more on the plot, this one is all about the emotion. There's not necessarily a lot happening in it, but I could feel the tension, grief, anxiety, hope, hurt, love and fear on every page. Honestly, I think the emotion is probably the strongest aspect of it. I ached for Emma, Sam and Jesse - for the way they'd all experience loss, no matter the outcome. Flirting is probably just as much about falling in love with yourself as it is with someone else. It's about seeing yourself through someone's eyes and realizing there is plenty to like about yourself, plenty of reasons someone might hang on your every word. There are so many quotes I'd love to share, but they might give too much away. So, I'll resist. But I highly recommend you pick up this book so you can discover them for yourself! One True Loves takes an impossible situation and heartbreaking dilemma and makes it accessible, thought provoking and unforgettable. No matter how you feel about the the conclusion, I can almost guarantee you'll be thinking about it long after you're done - asking yourself What if...? and reflecting on your own relationships. That's the best kind of read! You've written yet another wonderful review, Hannah! I love seeing you articulate your thoughts on novels, and I am especially in love with how you talked about One True Loves. That book! It really captures the theme and emotional nuances so perfectly, and I was so caught up in reading this (unconventional) love story. Great review, Hannah! I've added ALL of Taylor Jenkins Reid's books to my TBR now.